Watching Sunday’s sermon on the Hour of Power, part of Reverend Schuller’s message resonated with me. He explained how some people go through life saying “I can’t” and don’t take responsibility for their own life and actions. His children’s Kindergarten teacher did not permit the words “I can’t” in her classroom; only “I’ll try”. Like the Kindergarten classroom, can’t was a four-letter word in my childhood home. 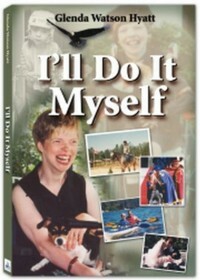 Despite my cerebral palsy and its limitations, I was not to utter the words “I can’t”. My parents encouraged me to try and to do my best. Of course, performing brain surgery and running a marathon weren’t viable options for me; with everything else, I was expected to try. Once I attempted the task with sincere effort and found I couldn’t do it alone, my parents didn’t have any qualms about helping me or finding another way around so that I could do it alone. The internet has opened a whole new world to me. I can finally communicate with others without my disability getting in the way. Oftentimes, others don’t even know I have a disability. If they do, they don’t know the extent of it. This means we can have more meaningful exchanges because we can bypass the misperceptions and misunderstandings of my cerebral palsy and get right to the topic at hand. It is such a liberating feeling! And, it is amazing who all I have connected with online. Email, online conferences and discussion forums enable me to participate fully in the virtual world and to lead the exciting life of an online solopreneur. Although this technology means greater inclusion in participating in the virtual world, there is a risk of becoming further isolated from the real world. The very technology tools that allow me to be accepted into the world as an equal can also isolate me even more as I draw further and further into the â€œvirtual worldâ€ with less and less â€œreal lifeâ€, face-to-face contact with human beings. In April 2005, I temporarily escaped Hermitsville when I was asked to speak at the Social Planning and Research Council of British Columbia’s (SPARC BC), â€œBeyond the Obvious: Exploring the Accessible Community Dialogueâ€. My initial thought was But I don’t give speeches. I can’t. Since I was raised without the word â€œcan’t” in my vocabulary, that was a fleeing thought. I quickly turned my thought to How can I do this? I had been using the free computer software ReadPlease for a couple of years to proofread my writing. ReadPlease reads aloud text that is copied into the program. I thought, Maybe I could put ReadPlease onto my laptop and have it read aloud my speech for me. I hesitantly agreed to speak. Unsure if the technology would work, I took a printed copy of the speech with me, in case I needed someone else to read it on my behalf. Finally, it was my turn to take the stage. Being on stage alone for the first time in my life, with two hundred eyes staring at me, I wanted to run. But, I didn’t. I gave my speech. When I was done, I left the stage, trembling. I had given my first ever speech! And the technology worked! You need to read my book I’ll Do It Myself to see what happened next! The point is, had I said “I can’t” without even trying, I would have a missed this personally momentous experience and subsequent opportunities. I would not be doing my first internet radio show this coming Friday! Also, by saying “I can’t” when asked to give that speech, I would have denied the other event attendees the opportunity to learn from my experience, which was the whole point of the dialogue. How selfish would that have been? What are you denying yourself and others by saying you can’t do something before even attempting it? What might you accomplish if you banished the word can’t from your vocabulary? Share your thoughts by leaving a comment. Author Asks What is Normal Anyway? CAN’T is just not a word that one could ever associate with Glenda. It just isn’t in her “make up”. I am so inspired by her and what she has accomplished in her life. Heck, I would be impressed by someone without CP accomplishing all that she has. Given her “limitations” (physically and otherwise)I am so much more in awe of what she has succeeded to do in her life and know that she has even greater things to accomplish in this world. She is an amazing person with whom I am honoured to call friend. To risk sounding cliche I think if more people were like her this world would be a far better place! You go girl!! !